The West Cork BIG SING! event on Saturday 10th October for Mental Health Day was a huge success and is now forming localised groups…..we are creating a BIG SING! Community! The new BIG SING! 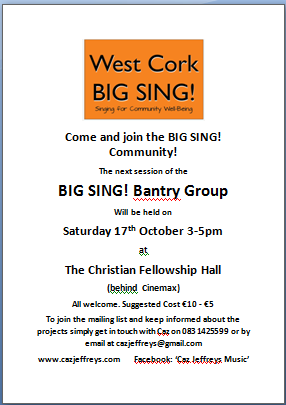 Bantry Group are meeting this coming Saturday 17th October 3-5pm in the Christian Fellowship Hall behind Cinemax. This will be a monthly group for the time being. Two more weekly groups are starting, one in Castletown Bere on Sunday 25th October 2.30-4pm in the Sarah Walker Gallery, and the other in Dunmanway from the Family Resource Centre on Monday 2nd November 7.30-9pm. Please help to spread the word……Come along and join the West Cork BIG SING! Community!! Next > West Cork BIG SING! takes on a life of it’s own! !